Chloromethane or methyl chloride is a hydrocarbon that is primarily used as an industrial solvent in numerous applications such as refrigerant, cleaning solutions, and others. The industrial chloromethane is formed through number of reaction technology and refining technology, by reacting methanol with hydrogen chloride. However, chloromethane naturally produced in the oceans by the action of sunlight on biomass and chlorine in sea foam. Global chloromethane market is expected to witness a robust growth over the forecast period. The market is expected to thrive at notable CAGR during the projected period of 2017-2027. Global market of chloromethane is expected to rise on the back of wide range of industrial application of chloromethane and rapid industrialization across the globe. Apart from Asia Pacific, North America chloromethane market is expected to grow at satisfactory pace over the forecast. 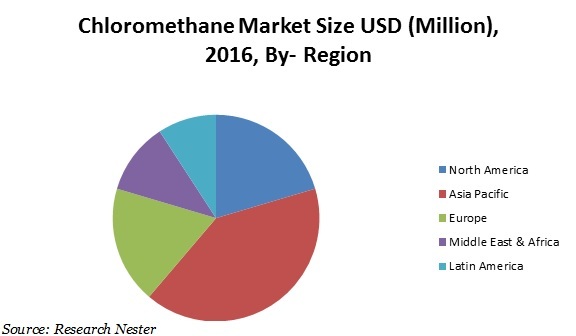 Large base of facilities that produce or process chloromethane in the United States and rapidly growing synthetic rubber production in North America is expected to be the dynamic factors behind the growth of chloromethane market in North America region during the forecast period. The market of chloromethane is further segment by application into refrigerant, pharmaceuticals, silicone polymers, chemical intermediate, cleaning solutions, coating and others. Higher chlorinated methanes such as methylene chloride, chloroform, and carbon tetrachloride has a number of applications such as, piping inlet coating, cable and wire insulation, anti-stick coating and in medical products such as syringe, catheters and more. However, silicone polymers segment is showcasing great potential for future growth owing to rise in demand for synthetic rubbers in plentiful end-use applications. Further, rising application of chloromethane in pharmaceutical, chemicals, automotive and other industries is expected to boost the growth of chloromethane market during the forecast period. Further, extensive consumption of chloromethane in diverse applications such as in production of higher chlorinated methanes is also an important factor driving the chloromethane market. Rapid industrialization in developing countries such as China and India is also augmenting the consumption of chloromethane across the globe. Development of new plants to meet the global demand for chloromethane is also expected to enhance the growth of market over the forecast period. For instance, The Meghmani Finechem Ltd invested Rs 140 crores to set up a chloromethane plant with capacity of 40,000 metric tons per annum (MTPA) in Gujarat. Additionally, increasing usage of chloromethane in the production of medicine and a solvent in the synthetic rubber industry is also pushing the market of chloromethane across the globe. Chloromethane is also used to make methylate silicon and in the production of agricultural chemicals, methyl cellulose, quaternary amines, and butyl rubbers. Such wide range of application of chloromethane is expected to drive the growth of market in future. However, high toxicity and flammability of chloromethane is major concerns which are expected to restrict the growth of market over the forecast period. A number of harmful effects of chloromethane, if directly expose to a person such as drowsiness, dizziness, or confusion and difficulty in breathing, walking or speaking are also expected to restrain the expansion of market.